Take Me Out to the Ball Game | American McCarver. Your Sports Blog. 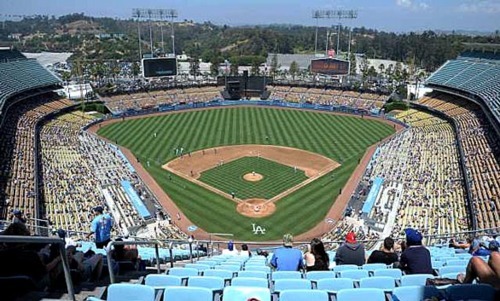 If you close your eyes, you can hear Vin Scully: It’s a great time for some Dodger baseball! Oh, sure, the team is bankrupt and demoralized and playing lousy. Everybody hates the owner, including his wife. A once-great franchise has been so long in the basement that they’ve started to redecorate, adding a nice sofa and thinking about getting a pool table and maybe a wet bar. But it’s still a great time for some Dodger baseball. Because the same brutal laws of capitalism that have hobbled the team also mean that I can get into Chavez Ravine for a buck. Slightly less, actually. Ninety-five cents. Oh, sure, they’re Top Deck tickets (you can wave at airplane passengers as they go by) and the Dodgers will be playing the Astros (one of the few teams in the league worse than they are) but that’s supply and demand for you. Who’s the World Champions now? OK, yeah, you are. But you’re a lot poorer for it. Me, I’m gonna take the family out to the ballpark. The game is next Friday, so there will be fireworks after. The high will be 80°, and by the 7:10pm first pitch, it’s going to wonderful out. The Dodger Dogs will taste just as good. If you ignore the actual baseball, it’s going to be a great time.